Step right up, step right up! 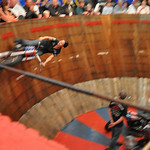 Thrills and chills await as motorcycle riders defy the laws of gravity. You won’t believe your eyes. A titillating name that hearkens back to the American circus sideshow era. It sounds forbidden, scary and most of all enticing. A thrill show indeed. 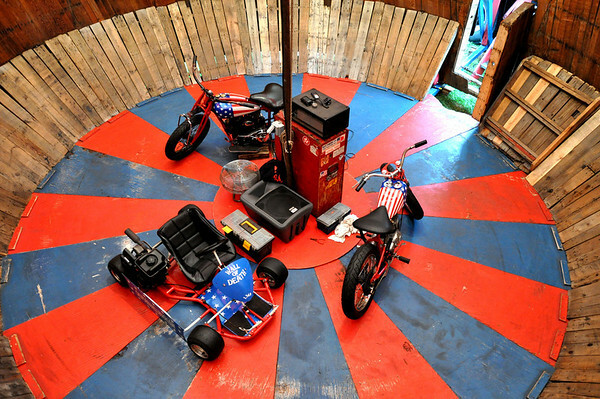 The exterior of the Motordrome has a Coney Island feel; red, white and blue all the way. It is a fire-breathing slice of Americana. 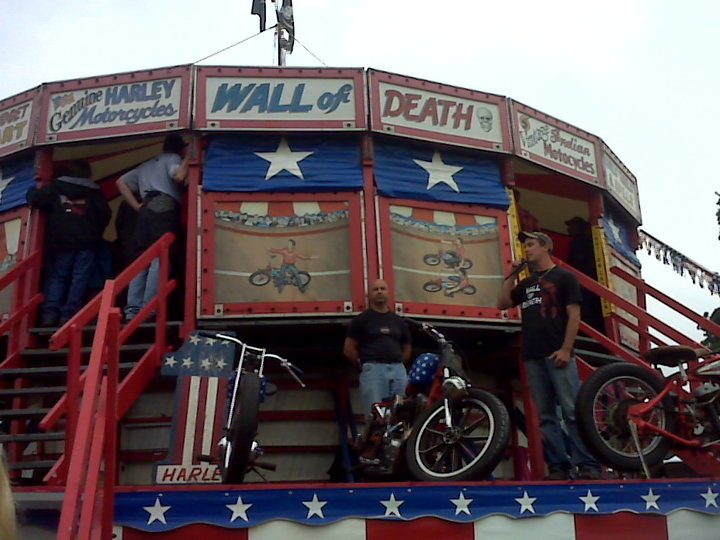 The Hell Riders proudly display their stars and bars painted Indian and Harley-Davidson motorcycles on the stage as they entice the crowd to come, one come all, to see their show. The crowd filtered it’s way up the stairs and into the mouth of the tent. 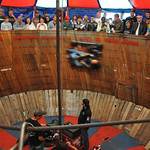 There was an excited buzz in the air as everyone peered down into the big wooden barrel. Once the music started and you heard the first engine come to life – you went to a primal place that was fueled by gasoline and impure thoughts. 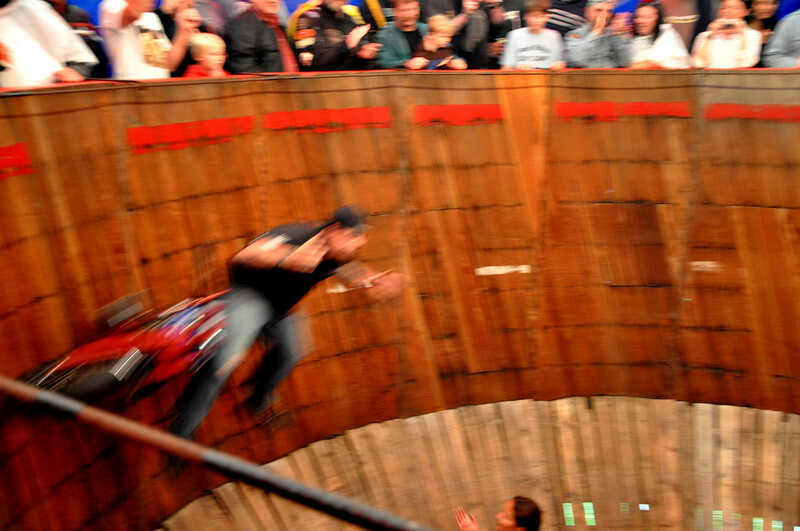 From the sound of the crowd and the roar of the bikes to the feeling of the vibrations that traveled up through the floorboards – you became completely transfixed by what is unfolding in front of you. 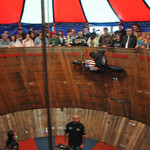 The show opens with Ian Daniels on board a go-kart that you would swear has no chance of making it around the walls of the barrel! 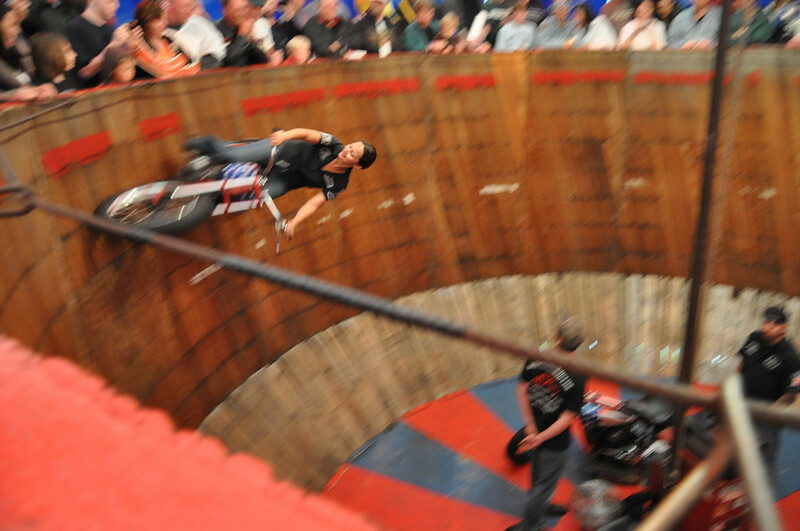 This trick is called the Slide for Life and it sets the tone for the excitement of the following three acts. Next up was Sandra D. on her 1957 Harley-Davidson Hummer. She climbed the walls higher and higher during her Dips and Dives of Death show. As Sandra went round and round, up and down the sides of the barrel she wore a smile on her face the whole time. As she rode closer to the top of the railing, it added to the element of danger that makes the show so exciting! 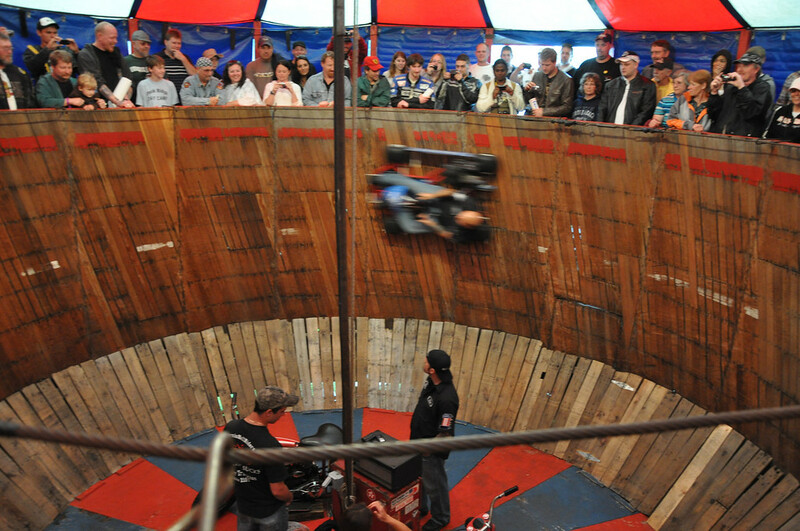 Don Daniels II aboard the 1930 101 Indian Scout brought the excitement to the next level as he whirled around the rim of the Motordrome with no hands on the bars. His specialty is free-handed acrobatic riding. Around and around he went, snatching folded dollar bills out of the hands of the thrill-hungry crowd. And just to kick things up a notch, he spun himself sidesaddle and sat on the Indian with no hands and feet on the controls! Awesome! The show closer really got the crowd going. It was called the the California Pursuit Race. 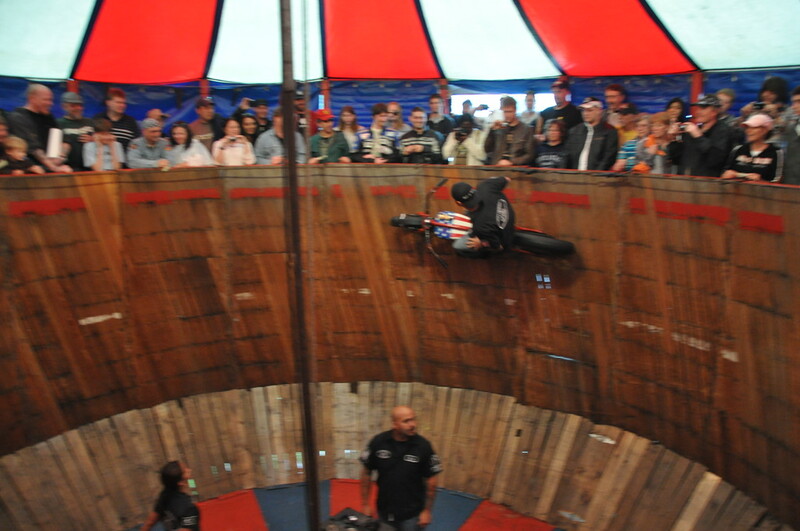 This act put Sandra D. and Ian Daniels in the Motordrome together at the same time. Ian on his go-kart and Sandra on the Harley climbing the walls together in a blur of speed and noise. How do they do it without colliding in their dizzying pace?! It was fantastic! I give this show a 4 shiny pink stars. It was really fun and exciting. 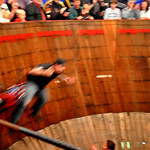 You can view their performance schedule on the Wall of Death website. It is not to be missed! Sorry about the photos being blurry, but I was just shooting blind while watching the show. It was too exciting to watch through a lens! Isn’t it exciting to watch? At first I will admit I was a little skeptical but they won me over immediately! Big fun. I’ve seen these guys twice now and would def see them again. A great show filled with nostalgia! Nice images of this riders.